Police arrested three “women of the Wall’ after they violated High Court limitations and wore prayer shawls in a “Rosh Chodesh” protest. 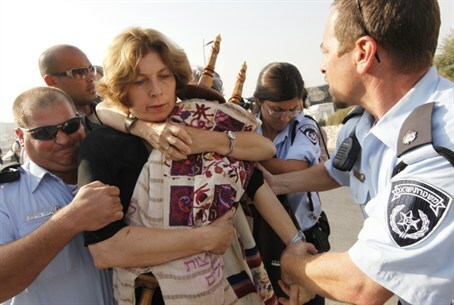 Police arrested three “women of the Wall’ after they violated High Court limitations and wore prayer shawls in a protest marking the beginning of the Hebrew month of Elul. Police warned the women before arresting them. The protest movement, led mostly by Reform and Conservative Jews, has campaigned against Jewish law and centuries-old customs. The High Court has set limits on women’s activities at the holy site so they preserve the dignity and respect honored by non-Jewish visitors at the holy site. The Women of the Wall often choose “Rosh Chodesh,” the first day of a Jewish month, to stage a provocation under the guise of prayer. Their most provocative action occurred nearly three years ago when a women attempted to read from a Torah scroll during what the rabbi of Western Wall, Rabbi Shmuel Rabinovich, called “a provocative act which turns the Kotel into a place of dispute, in contravention of High Court decisions." The Women of the Wall group was founded in 1988 during the first International Jewish Feminist Conference in Jerusalem. The High Court ruled several years ago that the women may not read from the Torah or wear prayer shawls at the Kotel but added that the government allows them to do so at an alternate site along the Wall, namely Robinson’s Arch, located nearby and outside the main prayer area. The group consistently ignores the ruling and tries to pray at the main site. Orthodox women's groups have asserted in the past that the real "Women of the Wall" are the masses of devoutly Orthodox women who pray there fervently night and day, every day - not just on Rosh Chodesh - and that they have the right to have their traditional form of prayer observed without having to deal with provocations.